It probably wasn’t a popular postcard, hence its rarity. It shows no stately buildings, flowered fountains, or other scenic treasures of our city. Rather it’s simply an artist’s rendition, a perspective drawing, of the western half of Arsenal Island. Dominating the picture is a tight rectangular matrix of buildings with clusters of other buildings nearby, all within a verdant landscape. Two bridges in the distance, one for a railroad, the second, called the Sylvan Bridge for wagons, link the island to the City of Rock Island. Col. George Davenport’s old house can be seen at the far right near the river. 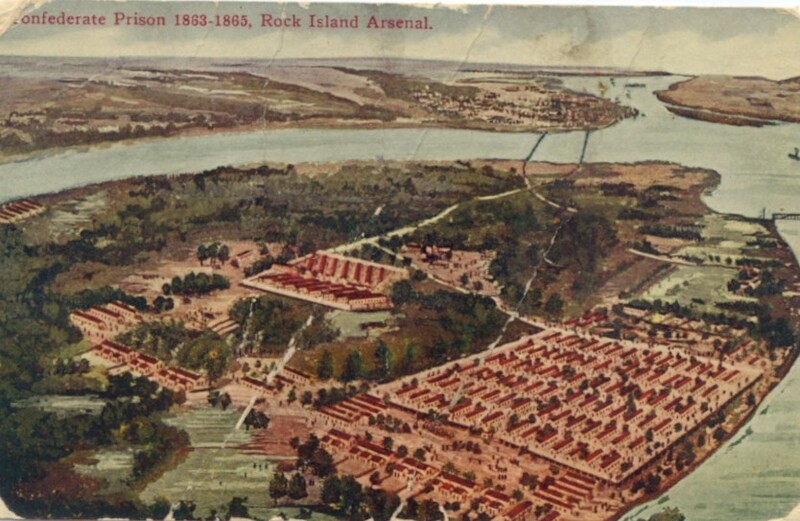 The caption is “Confederate Prison 1863-1865, Rock Island Arsenal.” That hastily erected Civil War prison camp was long gone by the time this card was published in the early 1900s. What remains of it on Arsenal Island is a cemetery for the nearly 2000 prisoners who died there. Yet that camp influenced our city’s history for decades and even the image remains an unsettling presence today. Federal Commissary General William Hoffman, who was in charge of caring for all Confederate prisoners, faced a growing number of prisoners in 1863. Arsenal Island was an ideal location for a prison camp. It had ready access via the railroad, yet its relative isolation and rocky shores precluded easy escape. Moreover coal and timber were available nearby, making construction and maintenance comparatively cheap. Equally important, the government already owned a great deal of the land. The camp was constructed on the north side of the island, just west of its center. A tall board fence enclosed an area 1250 x 878 feet, which held 84 barracks in clusters of seven as shown on the postcard. Every barrack, measuring 22 x 100 feet, was intended to hold 120 men. Each had two doors, 12 windows, and a kitchen with a 40 gallon cauldron. More telling was the directive from Quartermaster General Montgomery Meigs: “The barracks…..should be put up in the roughest and cheapest manner, mere shanties, with no fine work about them.” Outside the fence were other buildings for the federal personnel as well as hospital buildings. The camp became the impetus for the first bridge across Sylvan Slough from the city of Rock Island. City businessmen, led by Mayor Bailey Davenport, calculated that such a bridge would virtually ensure that commerce with the thousands of prisoners and their keepers would funnel though Rock Island. In 1863, that bridge was constructed in a matter of months using both city funds and donations and immediately proved to be a boon to Rock Island. The sale of services and goods to both prisoners and U.S. military created instant wealth. Local businessmen, with names like Cable, Dart, Knox, Dimock and Gould, prospered. Argus publisher J. B. Danforth wrote often inflammatory and inaccurate news and observations about camp activities and sold newspapers in the process. Although the camp was still unready, Southern military prisoners began arriving in early December, 1863, after major battles near Chattanooga, Tennessee, resulted in the capture of over 6000. They were tightly packed on trains that went north through Louisville and Chicago, then turned west to Rock Island. Although the trip took several days, there was little or no food on board. The captives were dressed for warmer conditions, without blankets or heavy coats, to face the weather which grew colder as the trains penetrated the north. It didn’t get much better for the nearly two years the prison camp operated. There was never enough food, and winters in the loosely constructed barracks were frigid despite two stoves. Southern families who still had resources sent money to their prisoner relatives so they could purchase additional food from Rock Island sutler, A. C. Dart, who made regular trips to the camp. Many were not so fortunate, and would eat anything that offered a bit of nutrition. Rats weren’t a problem at the camp because they were caught and eaten as soon as they set foot inside the fence. A few dogs, including a bulldog belonging to Mr. Dart, met a similar fate. Sanitation was a chronic issue, and the water supply for the camp – mostly the river – was often contaminated with the camp’s own raw sewage. With as many as 8600 prisoners in this 25 acre enclosure, basic sanitation was woefully inadequate and resulted in preventable disease and death. Yet, despite malnutrition and disease, the death rate was lower than that in most other camps of both the north and south. This may have been partially due to the generosity of local families, especially women with southern roots such as Lucy Buford. They assisted with clothing and blankets and even reportedly assisted in a few escapes. At the end of the war, there was plenty of blame for the conditions and suffering. Despite rations that were steadily reduced to starvation level, the Commissary General’s account showed a balance of three million dollars that could have been used to purchase food for prisons. Moreover, the Rock Island camp commander, Col. Adolphus Johnson, was accused, probably unjustly, by Mr. Danforth of deliberately mistreating prisoners. This brief summary of the camp is based on just a small amount of the information contained in “Rebels at Rock Island” by the late Benton McAdams, a former Rock Islander. The book, illustrated with many photos, is a detailed, scholarly, yet eminently readable and indeed fascinating story of the prison camp and its effects. His research encompassed federal and state archives as well as many writings by Argus publisher J. B. Danforth. It is available at most of our public libraries, where some appropriately have a second copy in their Special Collections. If you read it, you will likely want to buy it, it’s that good! This article by Diane Oestreich, slightly modified, originally appeared in the Rock Island Argus and Moline Dispatch on April 6, 2008.